(CNN) -- North Korea's ruling party plans to hold a meeting with its representatives in September, state media said Saturday. 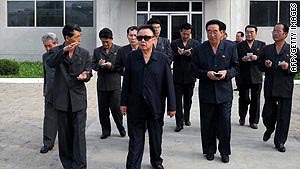 The meeting is "for electing (the party's) highest leading body," the North Korean Central News Agency said. An announcement by the ruling Workers' Party of Korea says it hopes to make "great changes" as it marks its 65th anniversary this year. "We are now faced with the sacred revolutionary tasks to develop the WPK ... into an eternal glorious party ... and further increase its militant function and role to glorify the country as a country prosperous and powerful socialist nation," the announcement said. Earlier this month, Jang Song Thaek, Kim's brother-in-law and long thought to be his right-hand man, was promoted to vice-chairman of the powerful National Defense Commission, state media said. Jang's appointment is crucial, said Kim Sung-han, a professor at Korea University in Seoul. Jang provides a support network for Kim Jong Un, who is his nephew. Jang is also a top military official, according to the professor. His appointment signifies the power succession process is taking place and that he plays a key role as "liaison between the party and the military," the professor said.